The way in which Donald Trump is conducting foreign policy has represented a break with diplomatic tradition, as he has shown to tweet or voice controversial opinions in a careless manner, and has had unfiltered exchanges with foreign world leaders. Such actions constitute an immense breach of protocol and lack consultation from the State Department or the U.S. intelligence services, as it is essential to assure that there is no conflict with current American foreign policy. Bellow, we analyze two recent examples of his unorthodox approach to foreign policy. Following Barack Obama’s decision to have his country abstain during vote for U.N. Security Council Resolution 2334, Donald Trump extended harsh critics to the American President, and reaffirmed his commitment to the Israeli cause. Relations between the two countries have severely deteriorated under Obama’s leadership, who had pled with Israel from the very beginning to stop building settlements in the West Bank, a request that the aforementioned resolution now embeds into international law. Even though he has yet to take office, Donald Trump became a part of Israel’s efforts to block the formal text when Prime Minister Benjamin Netanyahu called him in hopes that he would pressure the Obama administration into vetoing the formal text. Standing side by side with the foreign leader, the future U.S. President stated that peace between the two parties would only happen through bilateral negotiations, and not as a result of U.N. involvement. In spite of his claims that the organization provokes more problems than it solves, Trump had talks with the U.N.’s newly elected Secretary-General António Guterres on January 4, during which they had a ‘very positive’ discussion regarding U.S.-U.N. relations. On January 4, China’s official press agency reported that Beijing is struggling to adapt to the President-elect’s unorthodox foreign policy style, stating that diplomacy is not ‘child’s play’ or a business deal. Such declarations follow accusations of the President-elect regarding the country’s currency devaluation and military build-up in the South China Sea, as well as the official interaction between the U.S. and Taiwan on December 2nd. By means of accepting a call from Taiwanese President Tsai Ing-wen, Donald Trump broke 37 years of American practice (formally, the U.S. recognizes only the Beijing government), and further risked aggravating diplomatic ties with China by declaring that his country is not necessarily bound by the ‘one China’ policy. Although the call had been planned in advance by his staff, the White House was not informed about its occurrence. In response, Chinese state media reported that the country opposed any official interaction or military contact between Taiwan and the U.S., and approached the latter for clarification, being assured that there had been no change in policy. These recent developments in U.S. foreign policy during the ‘lame duck period’ showcase the diminishing influence of Barack Obama’s administration after the election of Donald Trump, which is highlighted by their strongly different stances on a variety of issues. The interactions between Trump and Russian President Vladimir Putin, constitute another instance of this (informal) division of power between President and successor. Regarding the U.S.’ refusal to block Resolution 2334, it would appear that, from an Israeli perspective, this development can hardly be seen as surprising. Not only there are numerous precedents of past American Presidents not vetoing Security Council resolutions against Israel, every single U.S. leader since 1968 has advised Israel to stop building settlements. Here, we see the other side of the ‘lame duck’ politician: one which is willing to carry out decisions that would otherwise lead to serious political fallout, was their term not coming to an end. Case in point, many democrats expressed their outrage at the decision here discussed. It remains to be seen, however, whether or not the elected President’s unwavering support for the Israeli cause will not lead the Middle-Eastern country to implement new, more hostile policies towards the Palestinians. Trump’s inexpertness in the foreign policy realm has been heavily highlighted by adversaries and critics since the early stages of his campaign, and the recent dealings with China and Taiwan illustrate it clearly. Other examples can be found in his talks with foreign leaders in Kazakhstan and Pakistan. Despite the fact that, as pointed out by Henry Kissinger, China remains calm, indicating that there is room for peaceful dialogue, Donald Trump’s recklessness has raised serious concerns in Beijing. If, as Chinese state media believe, his call was a result of lack of experience, then there is indication that he can be exploited by China. If rather than an accident, Trump endeavored a calculated provocation, then the U.S. will be open for retaliation, which may affect American business in the Asian country. For now, his approach has been praised within his own party, as Republicans have shown their support for the interaction with Taiwan, claiming that the U.S. has the right to talk to whomever they want. Still, by means of his unorthodox diplomacy, Trump may succeed in restoring some balance to the relations between the U.S., Taiwan, and China, as well as leverage a better trade deal with the later. However, it remains to be seen if China will allow the Taiwanese question, a first-order priority for the country, to be used as a bargaining chip. Unlike Obama, who kept U.S. policy in foreign affairs relatively constant, Trump seems bent on doing the opposite. 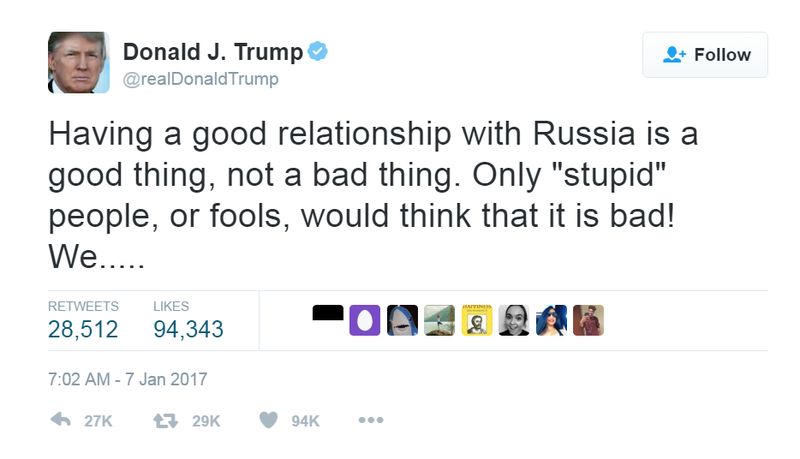 Photo: tweet by Donald Trump. Italian Constitutional Referendum: Modernising the State or a Path to Oligarchy? New American policy in the Middle East?